Backups. A dreaded word because it is tedious and boring. You say it and people go fleeing in all directions plugging their ears. So what do you do? 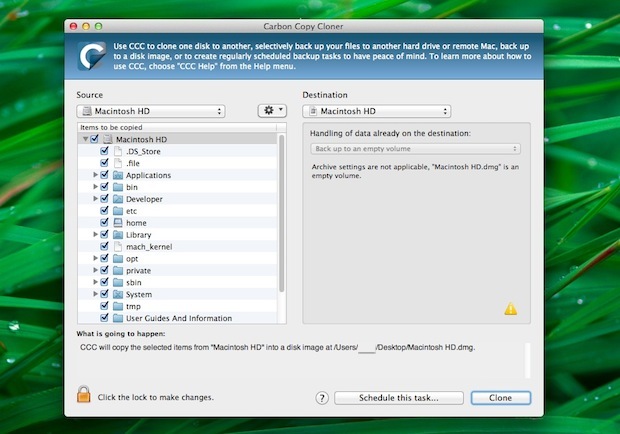 Have no fear Mac users, Carbon Copy Cloner is here for you to make Mac backups easy. Say hello to your newest friend, Carbon Copy Cloner. Carbon Copy Cloner creates a bootable clone of your hard drive, perfect for full system backups of a Mac. With an easy interface and simple backups, and it’s donation ware (or a free trial, depending on the version), that means you don’t pay unless you like it. Just another reason to love your Mac and the development community. Local (i.e., not over a network connection), HFS+ formatted partition or hard drive. Mounted disk image. Cloning to a disk image will (obviously), not yield a bootable volume unless you use CCC to restore the image to a physical partition or disk. CCC will not backup directly to CDs or DVD-R discs, though you can backup to an appropriately sized disk image, then burn the image to disc with Toast or Disk Copy. Of course Carbon Copy Cloner has it’s limitations, and you should spend some time with the included documentation to ensure that you are running things properly. It is also wise to check your backup and be sure it functions as intended. Carbon Copy Cloner is really great software for the Mac if you need to image a hard drive, whether for a backup, or to clone a hard drive to another drive, or for upgrading a drive to a new one and having it be the exact same as it was, or many other purposes. There are multiple versions of Carbon Copy Cloner available to download, the latest versions have a free trial while the older versions that support earlier MacOS X versions continue to work but mostly just for those older Mac OS X releases. That’s OK, just pick the version that works for what your needs are and what operating system version is on the Mac you’re working with.